Updated: Jan. 21, 2016 at 3:43 p.m. This post was written by reporters Madelyne Ashworth, Jenna Berman, Lauren Gomez, Brielle Powers, Meredith Roaten and Sam Rosin. Protesters captured national attention as they marched through the streets of D.C. Friday, speaking out against the inauguration of President Donald Trump. Prepared for arrests and tear gassing by police, anti-oppression protesters of the group Disrupt J20 gathered in Columbus Circle by Union Station early Friday morning to demonstrate against Trump’s ideologies. Members of Codepink, a feminist organization, met in the area as well. “We’re today to bring color, audacity, and brightness,” Campaign Director Ariel Gold said. “We have a sign here that says ‘Love Trumps Hate’, and that’s exactly what we’re out here today to say. 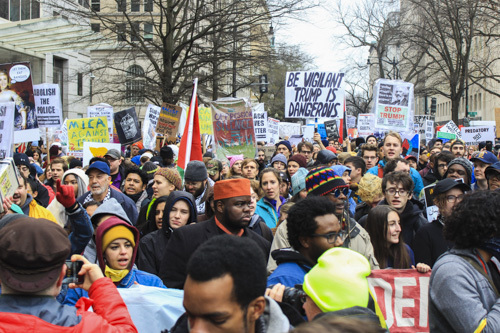 Just two blocks north of the United States Capitol and the inauguration ceremony, J20 protesters of all ages and backgrounds and carrying signs reading “Black Lives Matter,” “Not My President” and “Fight Trump Workers World Party” joined together before marching to McPherson Square. Some protesters dressed in rain gear, while others sported colorful face paint and many wore masks and goggles to shield them from potential tear gas. Sam Valdez, a 24-year-old Winthrop University student, J20 organizer and Association of Artists for Change representative from Charlotte, N.C., said she was not only prepared to face the repercussions of protesting but also encouraged fellow protesters to continue until they faced them as well. In addition to the growing crowd for the Disrupt J20 protest, Trump supporters adorning red “Make America Great Again” hats taunted protesters as they passed Union Station on their way to Capitol Hill. The arrival of a men’s group from Pass the Salt Ministries created tensions between protesters and Trump supporters as they preached their beliefs. Other Trump supporters wove through the Disrupt J20 crowds on their way to the National Mall, photographing and videotaping the protesters and occasionally yelling out disagreements. Paula Wilsoen, an educator and Trump supporter, questioned one of the protesters whether they could identify the picture of Frederick Douglass on their protest sign. The J20 protesters began their march on Massachusetts Ave toward McPherson Square. Although hundreds of people began the march at Union Station, many joined in along the way, including the Democratic Socialist of America. Employees of restaurants and shops left the storefront to witness and document the protest. 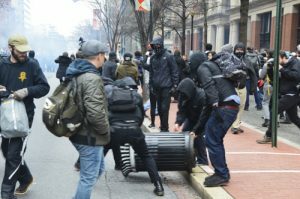 Police arrested 217 protesters in downtown D.C. according to multiple media reports, including J20 members, after several activists vandalized local property. A federal-class action lawsuit was filed Friday, claiming that Metropolitan Police Department and U.S. Park Police officers used unconstitutional tactics against the protestors, including confining protestors and spraying them with chemicals, Politico reported. Protesters first confronted police in the late morning, when police surrounded dozens of activists in front of a building at the corner of 12th and L streets. Police wore riot gear and fired tear gas at the protesters, who were affiliated with anarchist and socialist groups. Many activists arrived at the street corner after participating in other protests. Laura Makl, a supporting protester from D.C., came in response to a call for social protest groups to stand in solidarity with the detainees. “They can’t arrest all the thousand people that are here,” Makl said. Michael Georgeson from Philadelphia, who participated in that preceding anti-capitalist march, denounced the police. The situation escalated as protesters were detained in zip-tie cuffs. The crowd grew through the early afternoon, until police used tear gas and flash bangs to attempt to disperse screaming protesters. Many peaceful protested joined a massive social activist march, chanting “more love, less hate.” Marchers walked toward McPherson Square, agitated by the cannon shots of tear gas being fired in the distance. Streams of protesters arrived at McPherson, some with bright red eyes and faces, but most people were unaffected by the nearby chaos. At McPherson, people played music and chanted peaceful, listening to speakers and musicians. Activist Toby Blome said this protest was one of the many on her resume but this resonated with her differently. “There’s an intensity of this one that reflects the emotion people are feeling inside,” Blome said. Nearby, the Act Now to Stop War and End Racism Coalition held an on-stage protest in Freedom Plaza at 7th and D streets during the inauguration. Originally an anti-war organization, the coalition positioned their protest on an anti-racism, anti-fascism and pro-immigration platform while speakers and musicians were featured on stage throughout the day. Musicians like local D.C. vocalist Aaron Myers and a Palestinian band performed alongside speakers from organizations like the Philadelphia Socialists, the Coalition for Concerned Mothers and representatives from Hispanic immigrant communities. Some protesters complained of purposefully being held back by security at the entrance checkpoints while Trump supporters were able to pass through more quickly. Hundreds of protesters were still able to participate in the day’s demonstration, which began at 7 a.m.